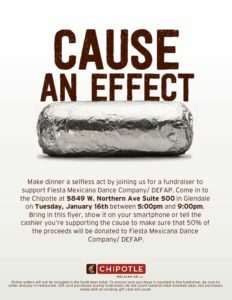 We are having a fundraiser today from 5pm to 9pm at the Chipotle on 59th and Northern to raise money for costumes and accessories for our dancers. Come treat your family and to a giant burrito for a great cause. Make sure to tell the cashier you’re there to support our company. Hope to see you all there!